This photograph shows a remarkable remnant from the construction of Woodchester Mansion. 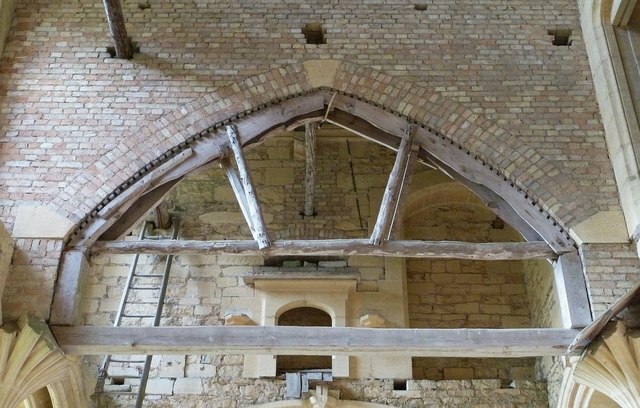 A pointed Gothic Arch has been created using a wooden former to hold the bricks in place during construction. The arch is complete, and the former could have been removed, but work halted so abruptly that the former is still in place. Woodchester Mansion is a treasure trove for architectural historians with evidence such as this. Woodchester Mansion is one of the most intriguing buildings in all of Britain. A sprawling pile of a house built in the Gothic Revival style which was so popular with the Victorians. It was, however, never completed, and remains to this day a magnificent "work in progress" - but one which will never be finished. This unusual state of affairs allows C21st visitors to see how C19th craftsmen went about creating the architecture of the day. It was designed and built by the architects Charles Hansom and his protegé, Benjamin Bucknall for William Leigh (1802-1873), a fervent Roman Catholic convert. He had inherited a fortune from his father who had made his money as a merchant trading mostly in groceries, Cheshire salt and tobacco in Liverpool. Construction started around 1856 and continued in fits and starts for the next 15 years but had ground to a halt by 1870, and ceased entirely when William Leigh died in 1873. The Mansion replaced an earlier house, "Spring Park", which was built by the Ducie family in the Georgian period (1700s) - it was this family that dammed the stream to create the five lakes. William Augustine Leigh bought the northern part of the Woodchester Estate, including Spring Park, from the Earl of Ducie in November 1845. His original plan was to modernize and enlarge this Georgian house, but the famous architect Augustus Pugin on visiting Woodchester, advised that it would always be damp and uncomfortable to live in. He suggested the construction of a new house - in the Gothic Revival style - on the site. Leigh took to the idea with alacrity, and set about creating the Mansion using the finest materials and skilled craftsmen, so that what now exists is all of the finest quality. Pugin produced an initial outline plan for the new house, but either because he would have been too expensive, or more likely that he was too busy - Leigh gave the commission to Charles Hansom of Bristol (incidentally, the brother of Joseph, the inventor of the Hansom cab). However, the actual design and ultimate building of the mansion was taken on by a young local architect called Benjamin Bucknall who had worked at Hansom's offices in Bristol. Bucknall was heavily influenced by Eugène-Emmanuel Viollet-le-Duc and brought the French architect's theories and ideas to life at Woodchester. Ironically, had anyone ever lived in the new mansion, they would probably have found it just as uncomfortable as the old Georgian one it replaced, as there was no central heating planned for it, and insufficient fireplaces to keep such a large structure reasonably warm. On visiting the mansion today, what is most fascinating is to see the building just as it was being constructed - with, for example: a former still in place beneath an arch; uncovered groin roofs; fireplaces stranded at first and second floor level with no floor to the rooms they would have served - the list goes on. A large number of rooms, corridors and stairwells over four floors (including the cellar) can be explored when one visits. They are in varying states of completion. The kitchen, for example, has certainly been used, and from the age and wear of the floor and cooking range, this may well be at least in part, a remnant from the earlier Spring Park. One room, named as the Drawing Room is completed (though unfurnished) and gives an idea of how the finished house might have looked. The most remarkable room in the house though is undoubtedly the Chapel - although currently rather stuffed with scaffolding. Leigh intended to spare no expense in creating this particular room due to his ardent Catholic beliefs. Like the rest of the house however, it was never completed. It is believed that it would have been the tallest private chapel in any house in Britain had it been finished. That the Mansion has survived in such a good state despite its incomplete state and effective abandonment for a hundred years, is down to three main factors: Firstly the solidity of the original construction thanks to Leigh's insistence on fine materials and Bucknall's construction. Secondly, and essentially, thanks to Reginald Kelly who for at least 20 years carried out essential maintenance - especially preventing water egress by keeping the gutters and roof valleys clear. Its third and final piece of good fortune came in the form of English Heriatge, The National Trust and latterly the Woodchester Mansion Conservation Group who have provided money, expertise and committed volunteers to continue its preservation - which hopefully is now assured for generations to come. There is a vast amount to see at Woodchester, but if you intend to visit (and enter the house) it would be best to check the opening times: see Link for details. The parkland in which it is situated, including the aforementioned lakes, is owned by the National Trust - see Link for information. And there are several other associated listed buildings (all Grade II), viz. SO8001 : Woodchester Mansion in snow I only just realized these are black sheep! What a marvelous seasonal image.